Page 2 of 3 - Photos from the 2013 Christmas Letter! This page shows ONLY photos which are included in the Annual Christmas Letter for 2013. On this page are the photos from June, July, August and September - Christmas Letter pages 8 - 13 inclusive. First Photo - Orchid Collage #1 of some of the orchids seen in June. 1. 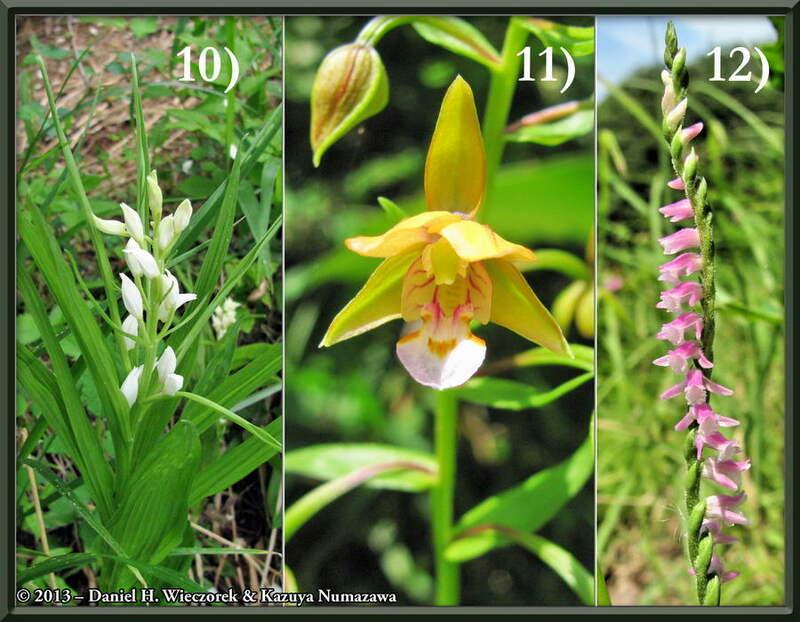 Calanthe discolor, 2. Cremastra appendiculata, 3. 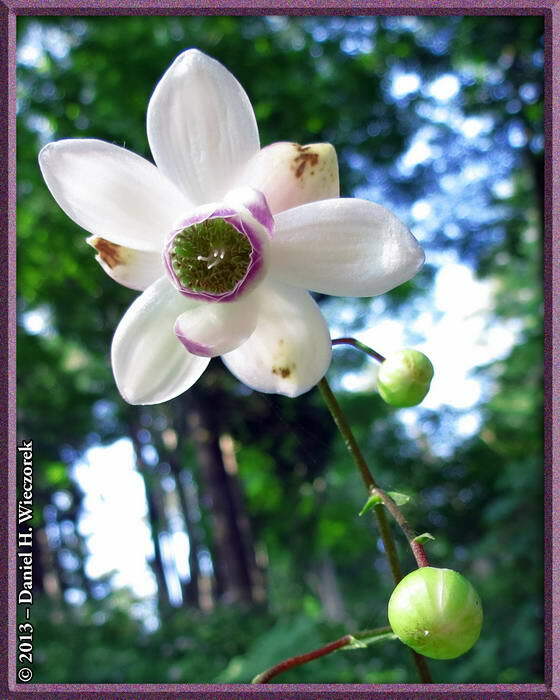 Dendrobium moniliforme – the Japanese Stone Orchid (Sekkoku in Japanese), 4. Galearis cyclochila, 5. 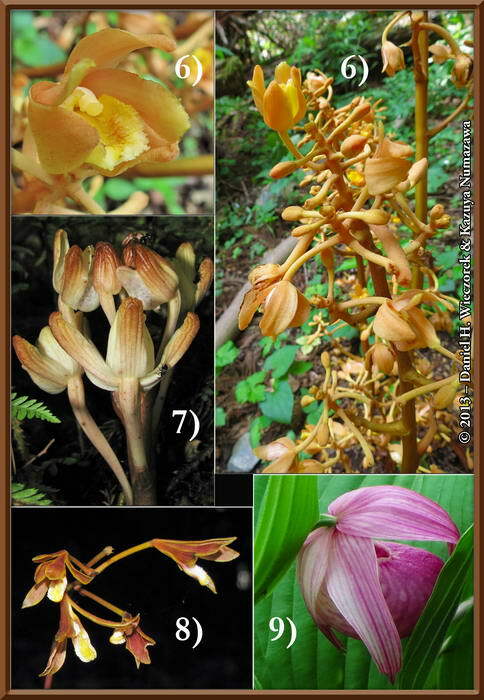 Neottia asiatica – a species without chlorophyll. Second Photo - Orchid Collage #2 of some of the orchids seen in June. 6. Galeola septentrionalis – a myco-heterotrophic orchid, 7. Yoania amagiensis – an orchid which very little is known, about 8. 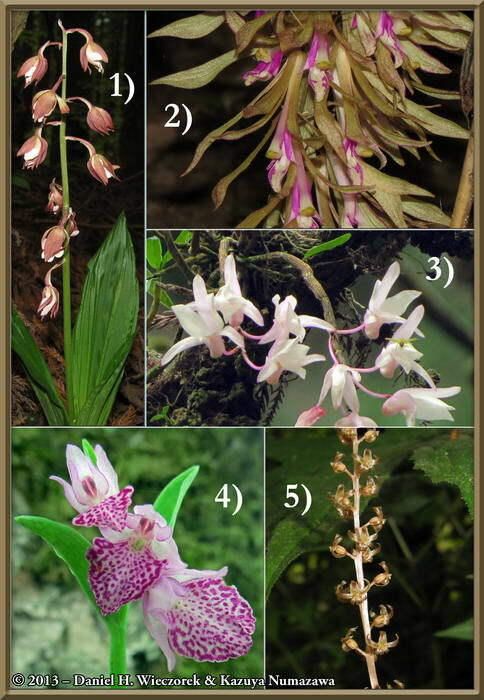 Lecanorchis japonica, 9. Cypripedium macranthum var. speciosum. First Photo - Orchid Collage #3 of some of the orchids seen in June. 10. Cephalanthera longibracteata, 11. Epipactis thunbergii, 12. 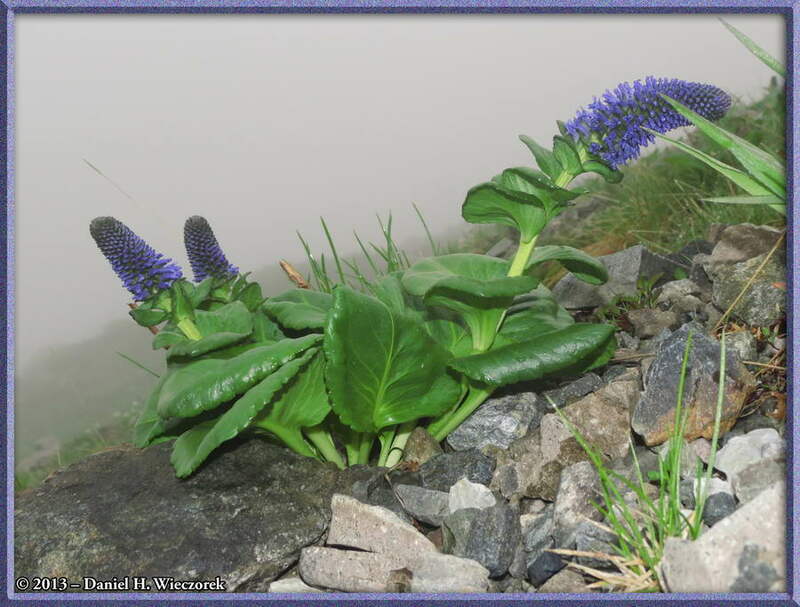 Spiranthes sinensis var. amoena. Second Photo - Climbing Mt. 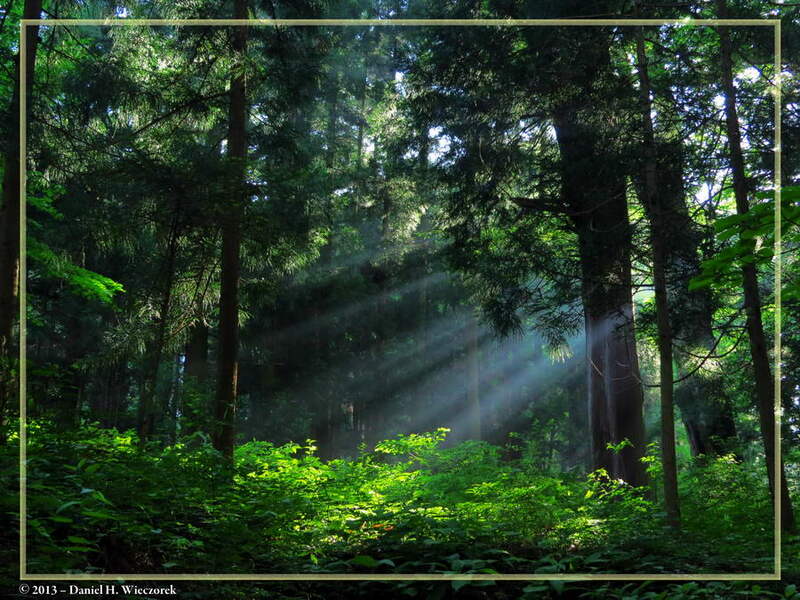 Mitsutouge; sun rays coming through the trees in the early morning. 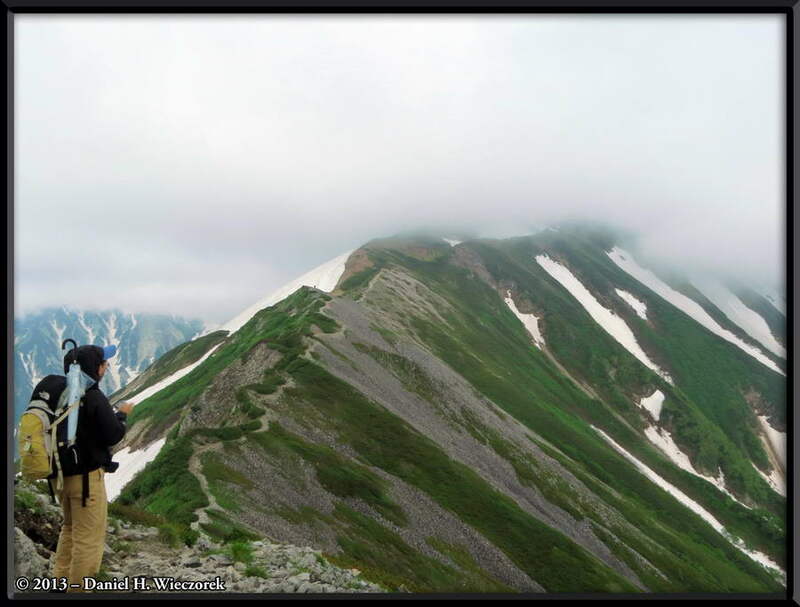 Page 9 of Christmas Letter - Climbing in Japan's Hakuba (Northern Alps) Mountains. 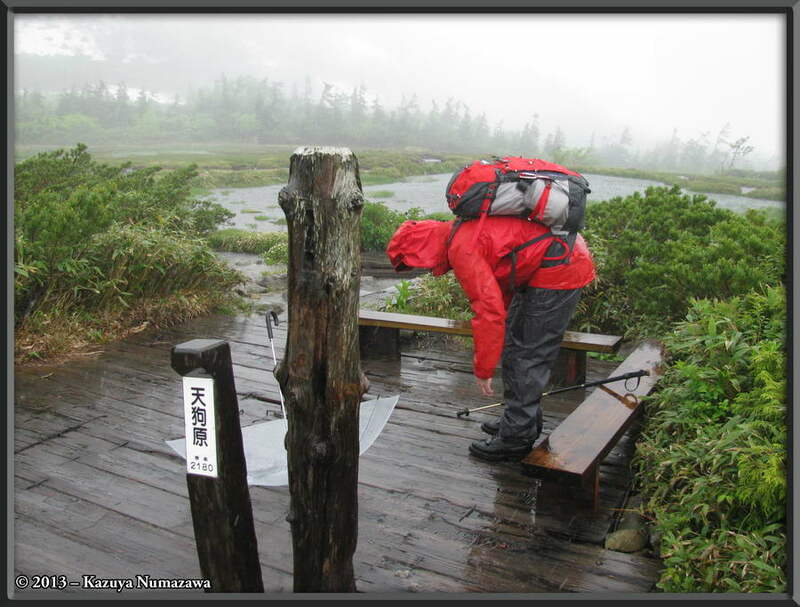 First Photo - Tsugaike Kogen to Ooike Hut - Daniel in the rain. 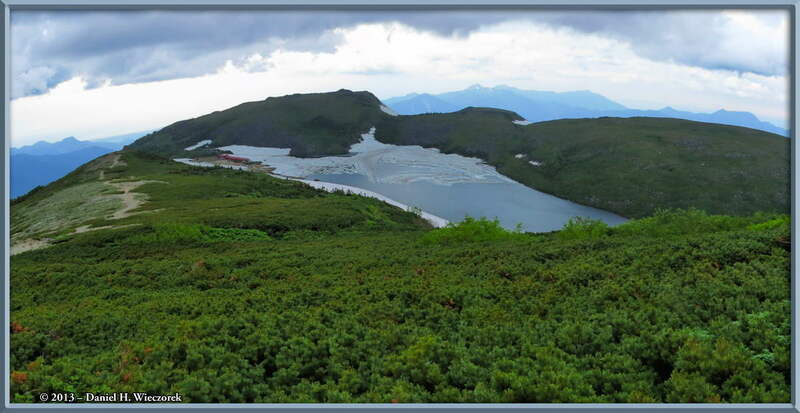 Second Photo - Tsugaike Kogen to Ooike Hut (which is in the background). 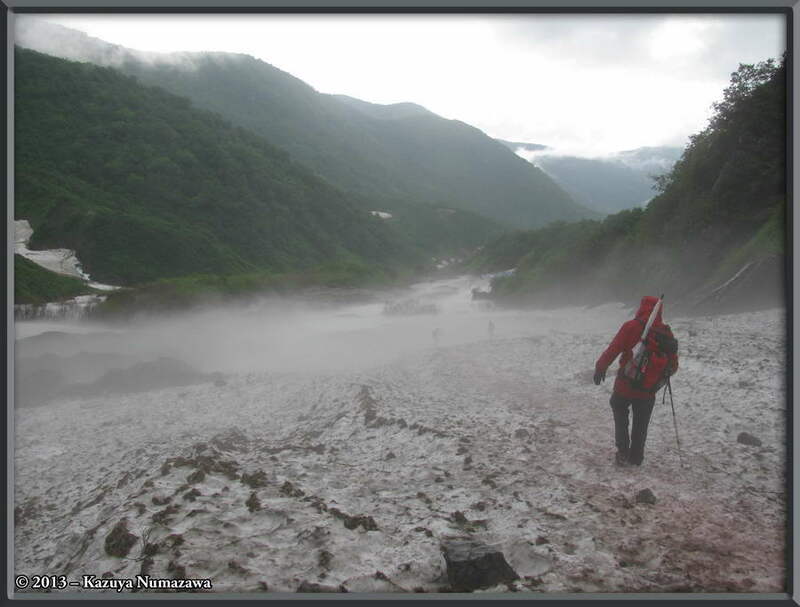 Third Photo - Two photo Panorama - approaching Ooike Hut. Page 10 of Christmas Letter - Climbing in Japan's Hakuba (Northern Alps) Mountains. First Photo - Looking back at Ooike while climbing to Mt. Korenge. Second Photo - Kazuya contemplating Mt. Korenge. Third Photo - Daniel at Mt. Korenge Summit. 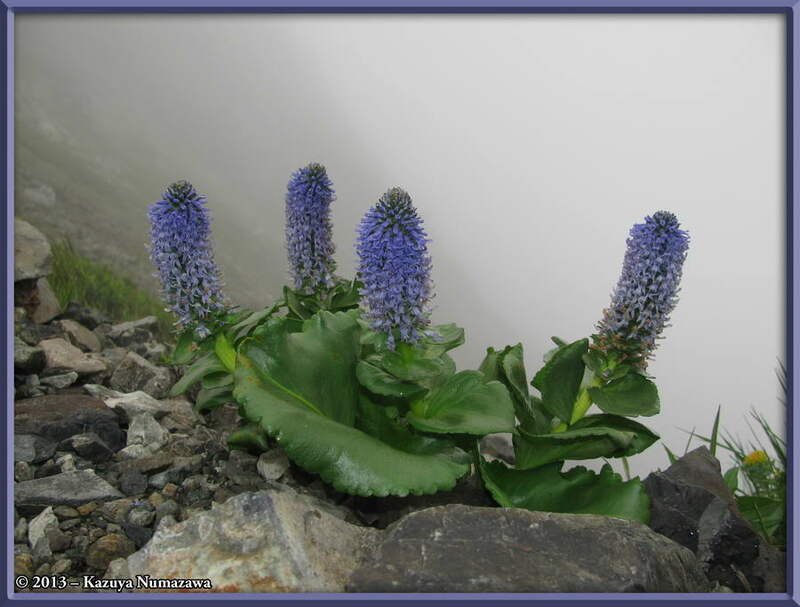 First Photo - This is what we came here in search of - Lagotis glauca - Weaselsnout in English. Second Photo - This is what we came here in search of - Lagotis glauca - Weaselsnout in English. 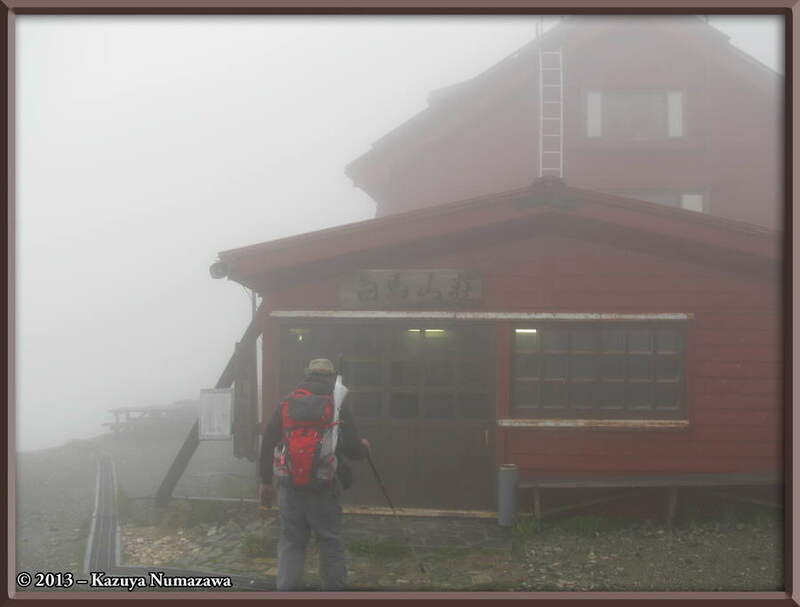 Third Photo - Daniel approaching the front door of the Hakuba San Sou Hut. 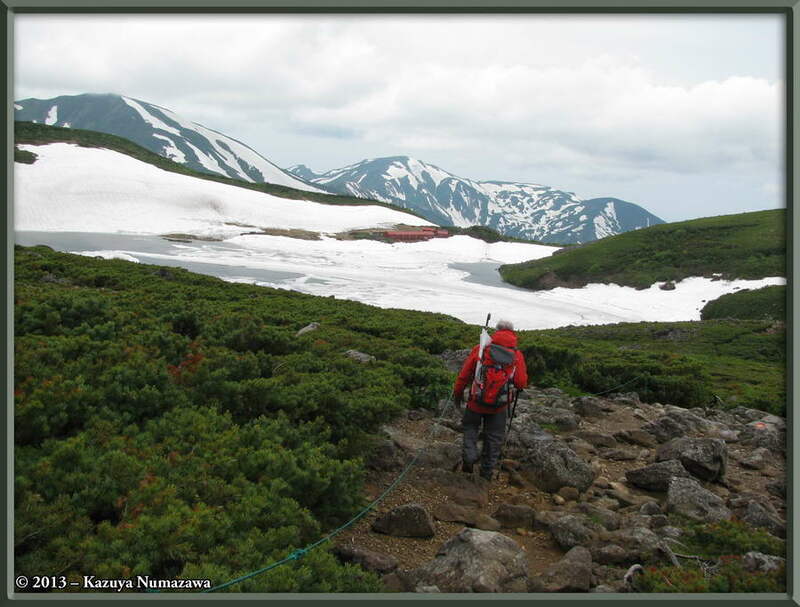 Page 11 of Christmas Letter - Climbing in Japan's Hakuba (Northern Alps) Mountains. 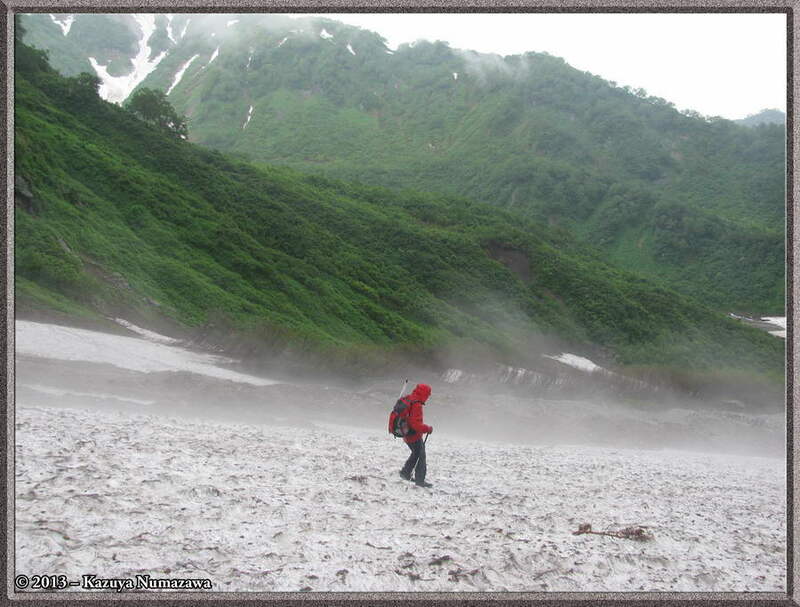 First Photo - Daniel on the “Big Snowfield” – Daisekkei Cairn in Japanese. 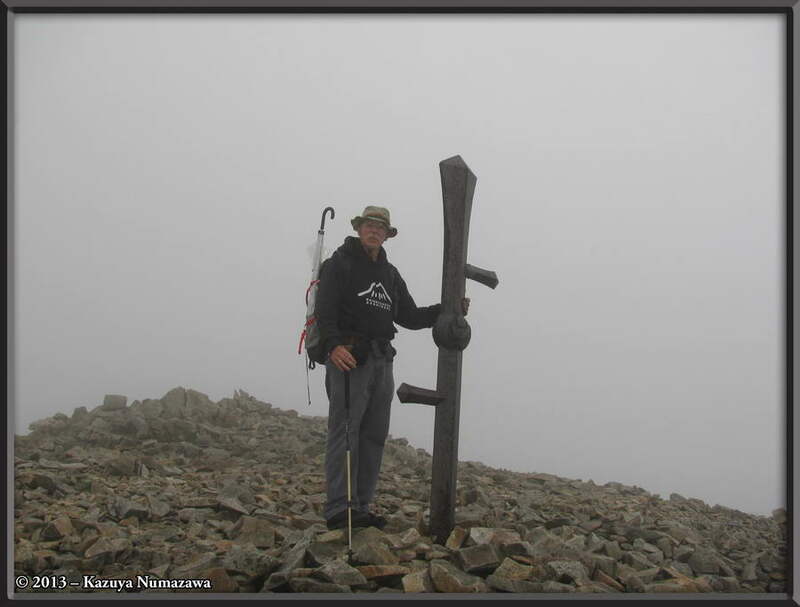 Second Photo - Daniel on the “Big Snowfield” – Daisekkei Cairn in Japanese. 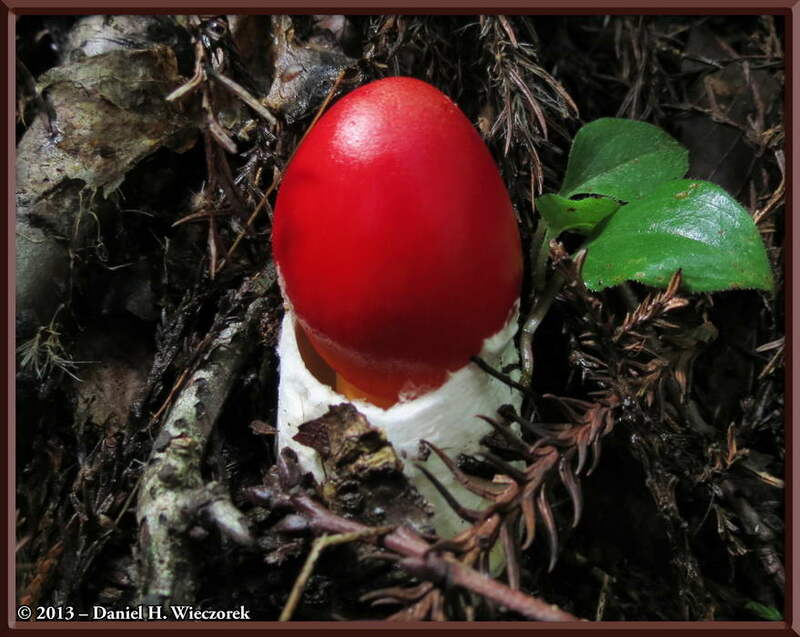 First Photo - A beautiful Amanita muscaria mushroom on Mt. Takao. 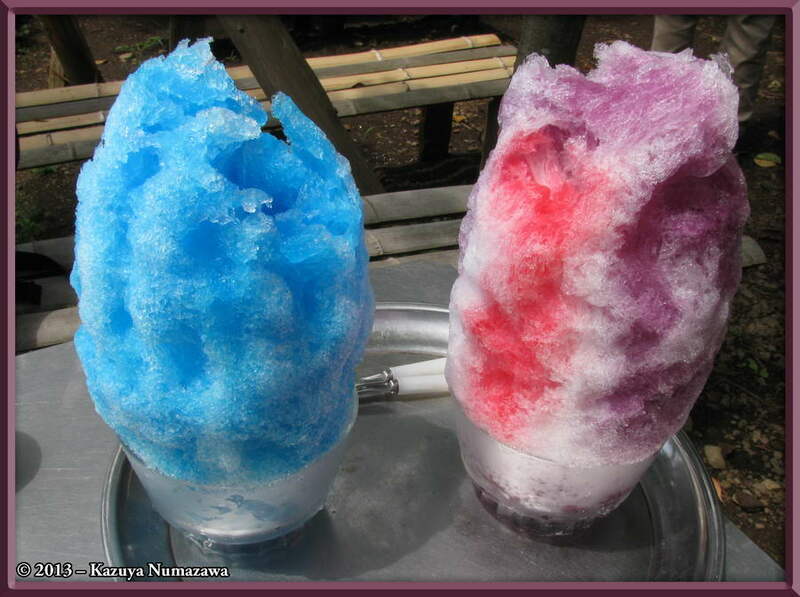 Second Photo - A Huge Shaved Ice (Sno-Cone) treat at Mt. Kobotoke-Shiro-Yama. 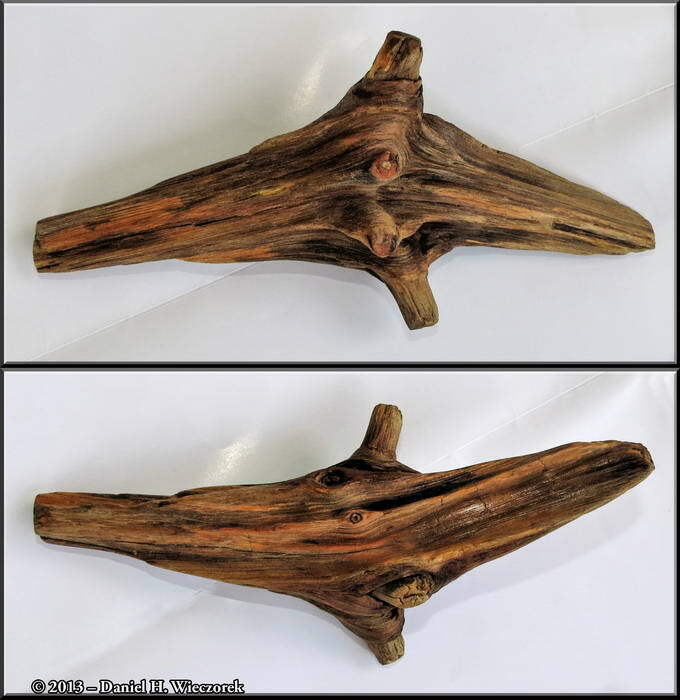 First Photo - An old piece of wood found on Mt. Mitsutouge - finished. Second Photo - Mt. Mitake Anemonopsis macrophylla (Rengeshouma in Japanese). 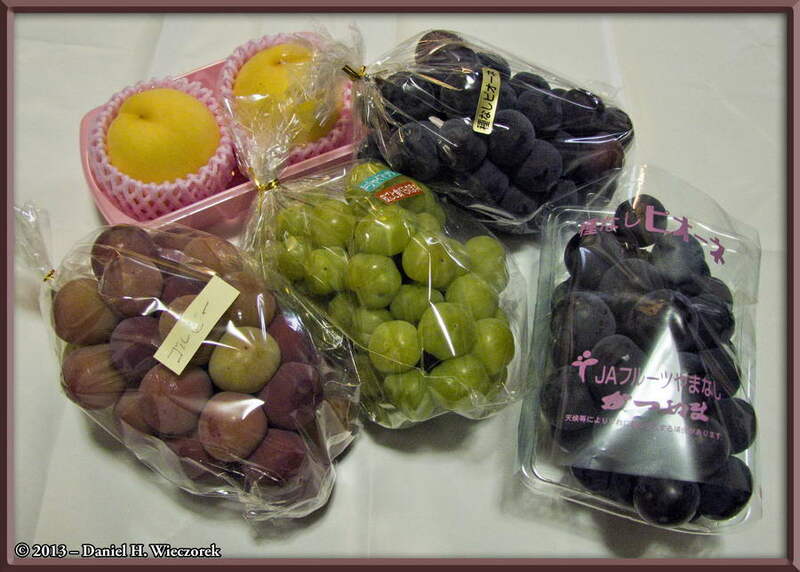 First Photo - Grapes which we purchased and brought home from Katsunuma Budoukyo. 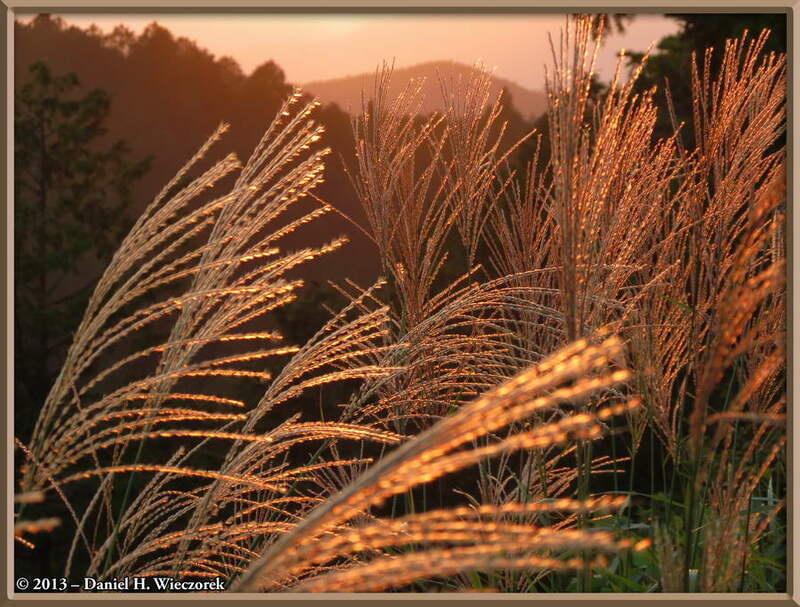 Second Photo - Susuki Grass (Miscanthus sinensis) at I-Ccho-Daira - sunset coloring. 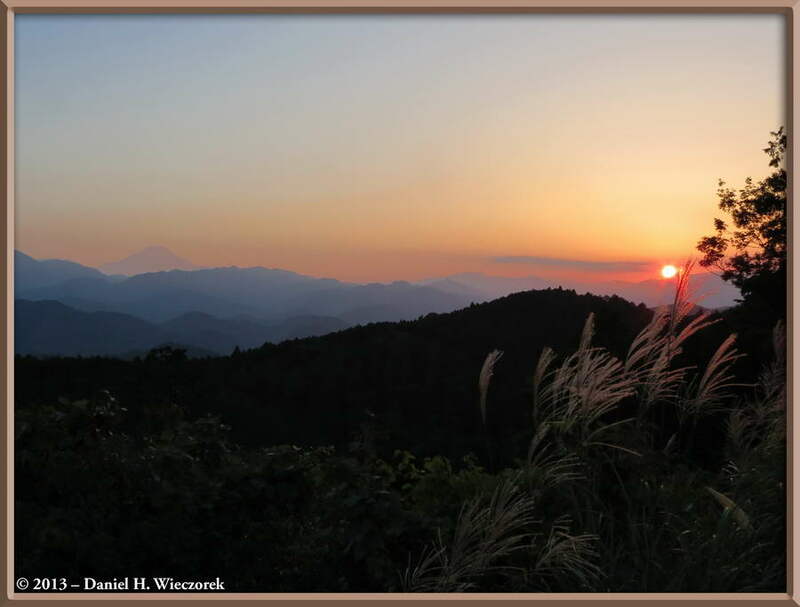 Third Photo - Sunset and Mt. 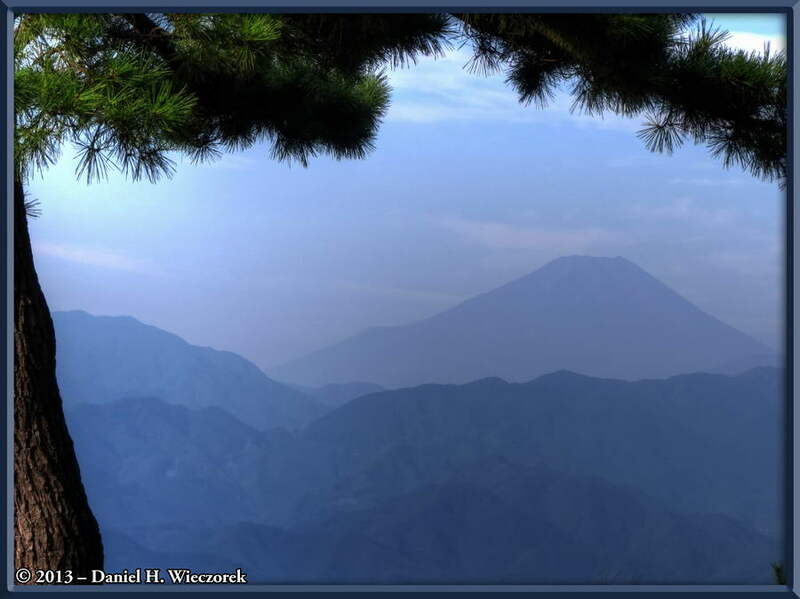 Fuji from I-Ccho-Daira, near Mt. Takao. 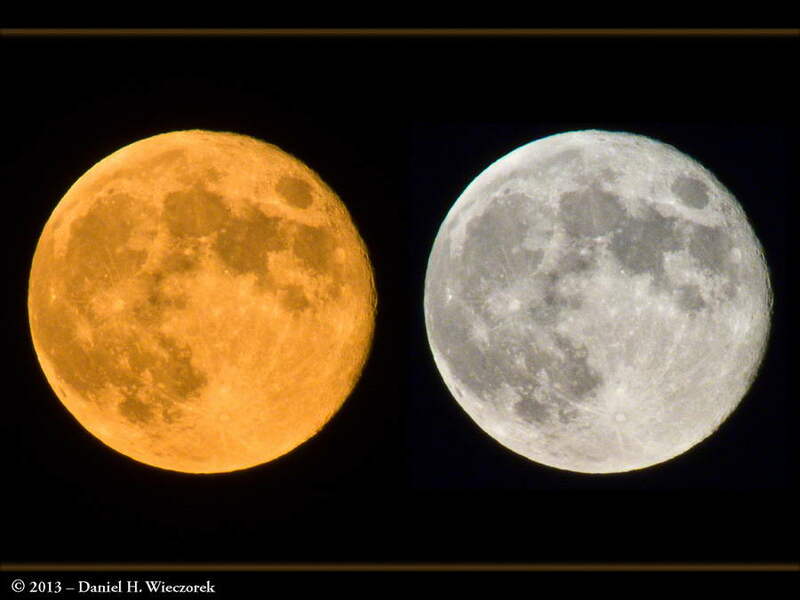 First Photo - Two separate Moon Shots - the yellow one just after moonrise with lots of low level haze, second one later after the moon was higher and above the haze. Second Photo - Mt. Fuji early in the morning from the summit of Mt. Kobotoke-Shiro-Yama. 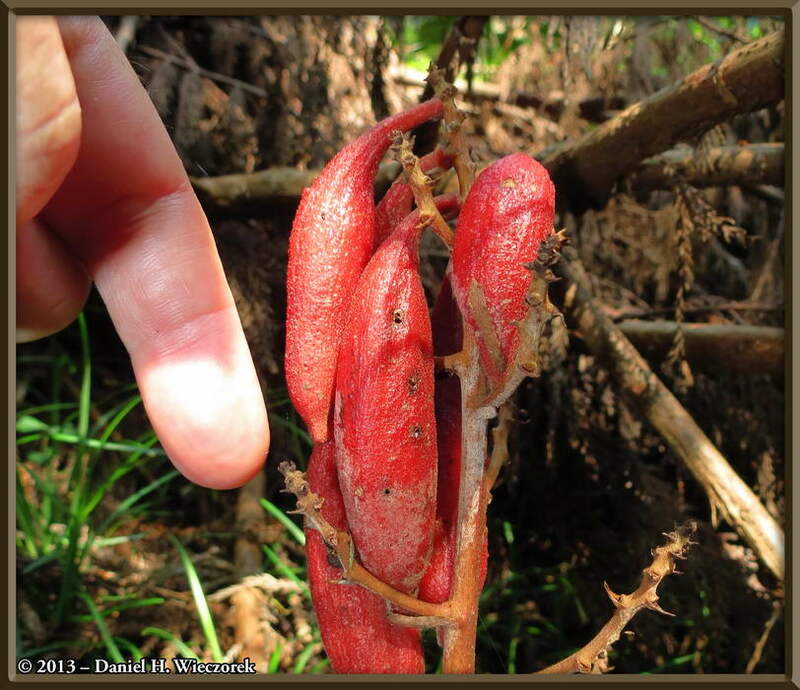 First Photo - The seed pods of the Galeola septentrionalis Orchid (Row #1, 2nd Photo, Orchid #6). 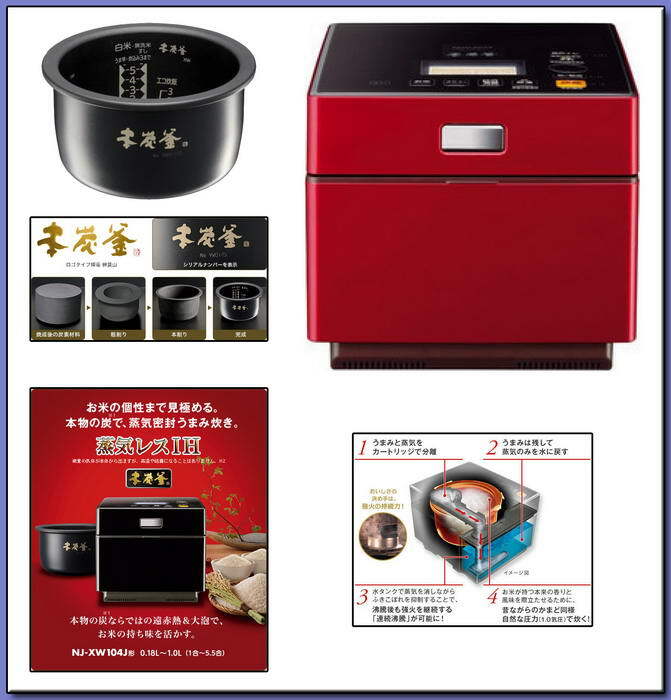 Second Photo - Our New Rice Cooker - a Mitsubishi NJ-XW104J Model (we have the black colored one).